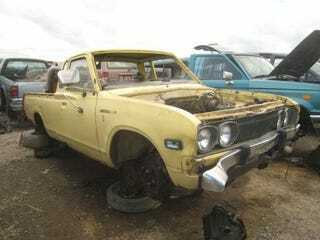 Earlier this year, we saw this '79 Datsun King Cab pickup in a Northern California self-service wrecking yard. Here's another one, in a different yard but with the same sad story: truly small pickups are just too small. This is the allegedly king-sized cab of this '76 Datsun; very useful for extra tools, maybe a floor jack or some 5-gallon jerry cans, but not so great for passengers. Note to all you Datsun truck fanatics reading this post in 2012 (or even today) after finding this post via an internet search: I shot these photographs three months ago, in a wrecking yard that crushes all vehicles after they spend six weeks on the yard. This truck has been crushed by now. There are no parts for you. I cannot ship you any parts. This is not my truck, and anyway IT HAS BEEN CRUSHED. Sorry.